The summer is coming up faster than we realize. With the summer season comes days spent on the beach with the sun on your face, the wind in your hair, and the water at your feet. The perfect beach chair can create the peace and relaxation you desire on the perfect beach trip. The towel will not live up to a great day at the beach anymore, covering you in sand that you will be cleaning out of every crevice for months to come. Your old, average beach chairs cannot hold up to the hype of the newest designs out there today. Do not settle for a traditional, boring old beach chair that will give out on you by the time summer is up. However, there are so many different types of chairs on the market with different features. There is the backpack beach chair or standard backpack chair, the folding beach chair, the cooler chair, the beach chair with a storage pouch, the camping chair, the beach chair with shoulder straps for easy carrying, the lightweight chair with an aluminum frame instead of a steel frame and polyester fabric and so on… all of which are comfortable, but which will suit your exact needs? So, before you ditch the beach towel in favor of your perfect chair to go with your beach umbrella, we will first discuss some key features for the best beach chair and then we will check out five of the top beach chairs on the market this year. There are several different designs to choose from when it comes to beach chairs. The style you choose depends on what you need and what you desire. So, let us check out the most popular beach chair designs with this quick view! The most common beach chair is often referred to as the classic design. These chairs are great for tanning. Unfortunately, they sit low to the ground and have little support so they are not a smart choice if you are physically disabled. Another popular design is the lounger. Loungers are spectacular for tanning and most come with headrests for comfort. The backpack chair is much like they sound. They are easy to carry because they fold up into a backpack so you can carry it as easily as you carry your beach bag. The materials of the frame can vary and can be just as important as the design you choose. Lightweight aluminum is the most popular material used for beach chair frames. This aluminum makes the chairs easy to carry but they are also easily damaged. Steel is the most durable frame you can choose. They now have innovative zero gravity chairs made from steel. These chairs evenly distribute the weight of your body. This position can relieve stress as well as improve your circulation. These are some pretty cool chairs. However, they can rust if they spend too much time in the water. Wood frames are growing in popularity on the beaches since wood does not conduct heat like steel or aluminum. Your frame will stay cool and they last awhile. This chair has a lightweight but durable powder-coated steel frame. It has a double bungee support system to secure the fabric to the frame, which holds up to 300 pounds. The fabric is Textilene and weather resistant making this chair great for more than just beach trips. The fabric is also breathable and does not hold heat so you will have a cool seat all day long, despite the sun. Better yet, it has padded armrests and a padded headrest for comfort. The zero gravity technology makes it easy to transition into any position. This chair is made of heavy-duty steel making it highly durable. It is made of 600D Oxford cloth with high density that will last for ages. It can hold up to 300 pounds. It is designed with a hole for your face so you can easily tan your entire body. The padded headrest is removable as needed. The back can be adjusted to four different levels so you can pick the perfect position for your comfort. This chair uses ergonomics which is great for your back and muscles. It folds up into a much smaller size to save space. It is also very portable at weighing 11 pounds. This folding chair has a frame made of rust-free aluminum. It is also made of 600D polyester fabric, making it very durable. It can hold up to 300 pounds. The armrests are contour molded. It can be adjusted to five different positions, including laying back. This chair has two large storage compartments. One of these compartments is even insulated to keep things cold. This folding chair includes an adjustable pillow/headrest as well as a hanging cup holder. It is extremely portable since it comes with a backpack to carry it around in. It is also very lightweight. This chair is made of high-quality powder-coated steel. It is made of a breathable mesh that can hold up to 300 pounds. It includes an adjustable headrest for lumbar support. It has a dual fingertip locking system so you can change to different positions including a zero gravity position. You can fold this chair up to save storage space. It is also very portable since it is lightweight. This chair is made of a heavy-duty and very durable powder-coated steel that can hold up to 250 pounds. It is low to the ground for easy relaxation. It has a seat back pocket as well as a cup holder. It is lightweight and comes with a carrying bag to make it portable. Finding the perfect beach chair can be the key to a relaxing and peaceful beach trip this summer. There are several designs, materials, and other quality features to choose from—all of which will depend on what works best for your individual comfort. 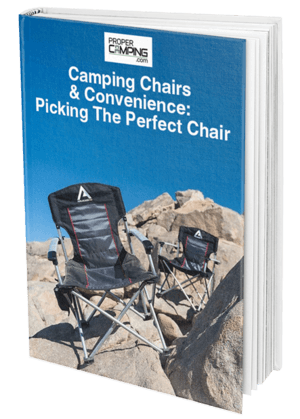 Keep in mind what your optimal comfort zone while shopping around and you will walk away with a long-lasting, portable beach chair to lounge the beautiful summer away. Summer is creeping up on us and I, for one, am excited for days of sand, a nice breeze, some swimming, and the sun!